Click on “check out our current ebay listings”. Aha I missed that. Of course the domain may have changed hands in the intervening 2 months but it does seem unlikely. (horsey stuff), educated (technically adept). Surely this man must read the pin! FF type , business for suckers, will sell your stuff on ebay for a fee. and does his best to cover his tracks. An anonymous Twitter user is harassing me on Twitter. I create my own anonymous Twitter account, strike up a conversation with them, lure them into clicking a link to a website I control, and then retrieve their IP address from the website logs. The IP address turns out to be a static address owned by an Internet cafe. I visit said cafe while stalker is tweeting away, and book some time on a nearby PC. Looking over at the stalker’s screen, I confirm they are using Twitter, and indeed, the only person in the cafe doing so. I use my camera to record the stalker actually posting a tweet from the anonymous account; the screen is visible, but the stalker is seen only from behind. Shortly afterwards, I exit and record more video of the stalker on the street just outside the cafe, this time with their face visible. Have I broken any Irish laws doing the above? Does it make a difference if each PC in the cafe is equipped with a webcam (i.e. reducing reasonable expectation of privacy)? Last edited by Tenshot; 14-06-2012 at 22:54.
this has been out for 2 months already??? He has a few active “for sale” ads on adverts.ie. This really highlights the ease of discovering who someone is if you can get them to click on a link. Proxies etc only go so far, and attackers can use some fairly convoluted methods to get your IP details if they can get you to click on a link. Any idea how the IP address was connected to the internet cafe? The only name I can think of from FF who is very good at the internet would be none other than the former advisor to the former minister for europe Coque Roche, whats his anme on twitter skearin ?? 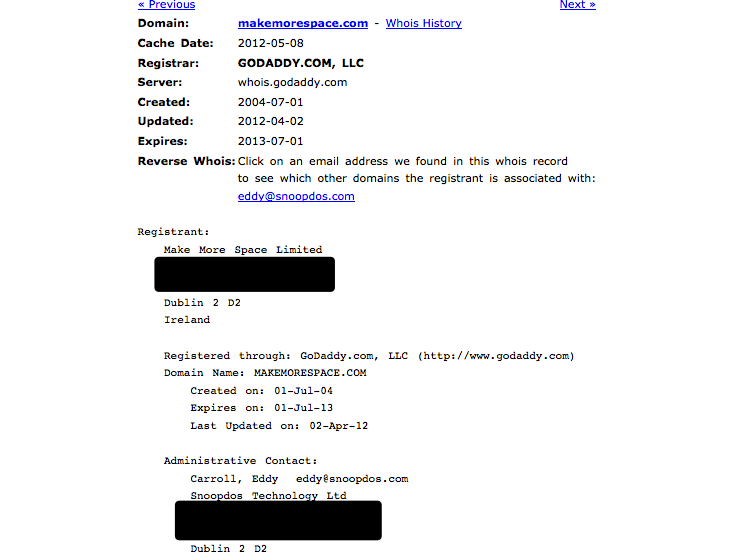 OK, with a lot of help from another pinster… the whois record for makemorespace.com is privacy protected. But, before July, it was not. It was registered to an Eddy Carroll. There is an Eddy Carroll who is an FF supporter according to some googling. wow, he got strung by his own trap he used to snare andrews. he walks into the internet cafe with andrews sitting there and andrews doesnt recognise him??? he must be well up in that organisation. TOR! Use it. It’s not rocket science. Clean install of your OS of choice on a bootable USB stick and Bob’s your uncle. Of course there is no better way to attract the attention of major intelligence services than to use Tor. You should also assume that they can decrypt Tor traffic. I’m glad her husband as defended her integrity. She seems to be one of the new wave of honest Fianna Failers who will make a clean break with the corrupt past. Ms Byrne was elected one of the party’s vice-presidents at the ard fheis earlier this year, and was one of only two members of the national executive who abstained on the vote to bring forward a motion to expel Bertie Ahern from the party in the wake of the Mahon Report.